Last week DBS, OCBC & UOB led the STI’s 3.4% gain, with the 3 banks averaging a 6.1% gain. This has brought the average 2019 YTD total return of the 3 banks to 8.6%, and their 5 year average annualised total return to 10.3%. For FY18, DBS, OCBC & UOB averaged 19% YoY net profit growth. Combined, the 3 banks reported total income (pre allowances, expenses & taxes) of S$32.0 billion for FY18, up 6.6% from S$30.0 billion in FY17. Shareholders have been rewarded with the 3 banks maintaining an average dividend yield of 4.0% for the past 6 months, which represents the longest period of time in their recent history that their yields remained at or above the key 4.0% level. 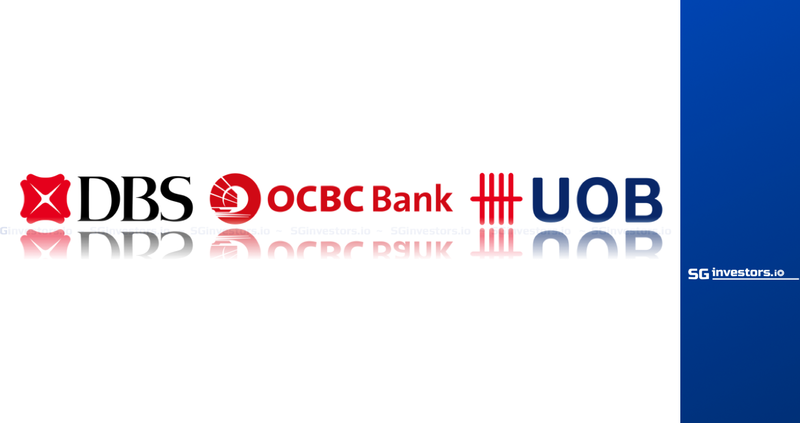 Singapore’s 3 listed local banks, with a combined market capitalisation of S$163 billion consist of DBS Group Holding ("DBS"), Oversea-Chinese Banking Corporation ("OCBC") and United Overseas Bank ("UOB"). Last week, the Straits Times Index (“STI”) gained 110 points or 3.4%, to end the week at 3322, with the 3 banks rallying 6.1%, as DBS gained 6.9%, OCBC gained 6.0% and UOB gained 5.3%. The 3 banks are expected to report their 1QFY19 results in early May, with UOB confirming it will release its earnings before trading on Friday 3 May. In FY18, DBS, OCBC and UOB averaged 19% net profit growth from FY17 (following on from 11% net profit growth in FY17 from FY16). UOB reported total income of S$9.1 billion, up 6% from S$8.6 billion in FY17. The average Net Interest Margin (“NIM”) for the 3 banks in FY18 was up 7 basis points (“bps”) from 1.72% in FY17 to 1.79% in FY18. The FY16 NIM averaged 1.73% for the 3 banks. NIM represents annualised net interest income as a percentage of total interest bearing assets. 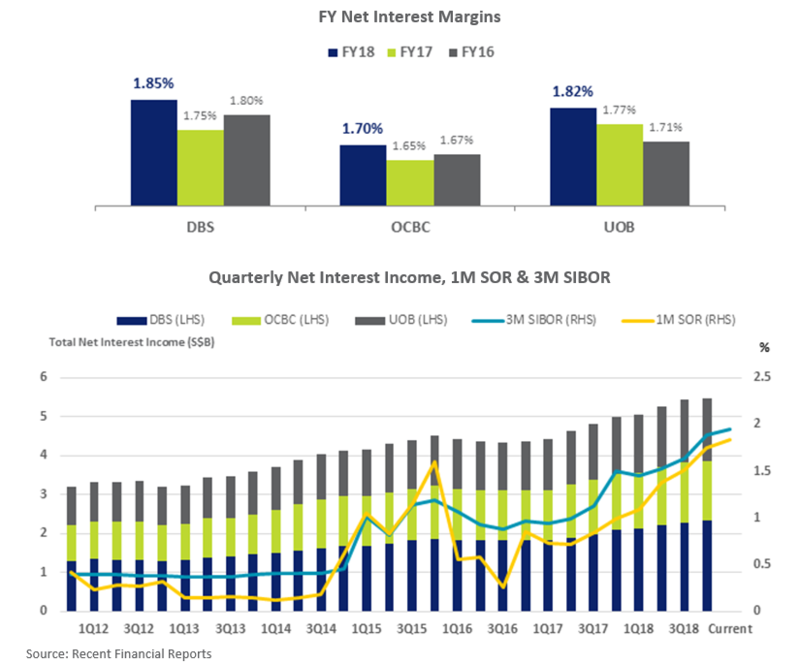 Combined, the quarterly net interest income for the 3 banks has gradually grown in recent years and has been consistently above S$4.0 billion for each quarter since the end of 2014. Moreover, combined quarterly net interest income was above S$5.0 billion for each quarter in FY18. This has coincided with gradual increases of local interest rates as represented by the 1-month Swap Offer Rate (“SOR”) and 3-month Singapore Interbank Offered Rate (“SIBOR“). As of the end of March, the average indicative dividend yield of the 3 banks stood at 4.2%, which has since retraced to 4.0% with the strong gains of the banks in the April month-to-date. At the end of March, the average yield of DBS, OCBC and UOB had ended each of the preceding six months above 4.0%. This was the lengthiest time in their recent trading history that the average dividend yield for the 3 banks had consistently held above 4.0% at month end. The average indicative dividend yield of the 3 banks at month-end dating back to major market lows in mid-2009 are illustrated below.